Immune System Boosters for Kids: 10 Fun Ways to Keep Them Healthy! Getting sick is a pain in itself, but when your kids get sick it’s a whole other ball game. Runny noses, coughs, and sneezes always sound so much worse when they’re coming from a child, and don’t even get me started on fevers. That’s why immune system boosters for kids are key to an illness-free, healthy season. I don’t have kids myself, but with a huge family and former teenage babysitting duties, I’ve had my share of looking after sick kids. They’re so much more fun when they’re tugging at your leg to play hide and seek and dressing you up for a Princess tea party than when they have a fever in bed. The latter just breaks my heart. But working these immune system boosters into your kids’ daily routine will help keep them in tip top shape! Of course a healthy diet is always best. Make sure you are filling their bellies with lots of fruits and veggies, proteins and vitamins. Sugar suppresses the immunity, so it’s best to keep it out of reach as much as you can. And make sure they have lots of time to play and rest. The fresh outdoor air is good for your babes, and they need ample sleep every night. These preventative methods, along with the following immune system boosters will help your kids stay healthy throughout cold and flu season, and beyond! From immune boosting smoothies to chicken soup packed with antioxidants, these are 10 of the best immune system boosters for kids! Probiotics are good bacteria that result in a healthy gut, and they’re a great way to boost your child’s immune system. Probiotics are also great for the digestive system and help with the absorption of vitamins, minerals and nutrients. You can find probiotics in kid-friendly foods such as yogurt, kefir, pickles and dark chocolate, or you can try a probiotic supplement. Do your little ones love smoothies? Healthy smoothies filled with ingredients such as berries, apples, chia seeds, cinnamon, and bananas work great to keep the immune system in check. Plus, they’re super fun to make each morning, and a blender like the Magic Bullet NutriBullet makes the process quick and easy. Start the day off with a delicious smoothie your kids are sure to love! Ask them what their favorite ingredients are, and sneak in the ones you know are best for them! Elderberry syrup is a quick-acting remedy against cold and flu, so if you see the beginning symptoms of a cough, reach for the elderberry! It works for anything that effects the respiratory system and a lot of kids actually love the taste! Elderberries naturally stimulate the immune system and are strong antioxidants. Getting your daily dose of vitamin D is extremely important for your health, and especially the health of your kids. Vitamin D is an important component of T-cells, which guard your body against bacteria and disease. You can find vitamin D in milk, orange juice, and supplements and drops, or of course, direct sunlight is best! Make sure you are giving them vitamin D3, not D2, which is synthetic. With the influx of technology for children, screen time is at an all-time high and many kids are spending their time watching TV or playing on iPads rather than getting outside or having playtime with friends. Exercise boosts the immune system and keeps your little ones healthy. Enroll them in extra circular activities like sports or gymnastics, take them to the park, get them to play and jump around with their friends. Keep them moving! Proper oral hygiene is essential for healthy kids! Make sure they are brushing their teeth every morning and night to prevent the spread of sickness. When you don’t brush and floss regularly, plaque will accumulate on the gums, which makes it easy for bacteria and infection to form. A healthy mouth contributes to overall health, so make brushing and flossing a must in your household. You can make brushing more fun by setting a toothbrush timer. It runs for two minutes and you can choose their favorite color! Fluids like water, soups and teas are essential for a healthy immune system. The immune system doesn’t work properly when it’s dry, and when you’re sick, you tend to lose even more fluids. To keep your children healthy, they should be drinking about 5 glasses of water per day. This will help protect them against bacteria and illnesses that take off during cold and flu season. Homemade chicken soup is one of the heartiest meals around, and you can stock it with immune-boosting ingredients. Chicken is a great source of protein, which your body needs for both growth and repair, plus you can add in veggies like dark leafy greens, carrots, and celery. Make sure to add lots of garlic, too! Garlic is a super immune system booster in itself. It’s anti-bacterial, anti-fungal and anti-viral, plus it’s one of the best natural antibiotics! Since our bodies can’t make omega-3 fatty acids themselves, it’s important to get them elsewhere. In order for our immune systems to stay healthy, they need these essential fatty acids. You can buy omega 3 supplements for kids or find it in foods such as nuts and seeds, eggs, soy beverages, and salmon. Echinacea is an herb that majorly supports the immune system as it has been found to increase white blood cell activity. Since white blood cells are the body’s natural defense against sickness and disease, increasing their activity is definitely a good thing! You can mix alcohol-free Echinacea extract into your kids’ drinks and smoothies, but keep in mind, with any type of herb, it’s important to test the waters first. Make sure they don’t have a reaction or allergy before going with it full force. And if you have any doubts, always ask your doctor. These immune system boosters for kids will help keep your household healthy this season. Make sure your little ones are fed a healthy diet, and are getting proper play and sleep time. It will make the season much more enjoyable all around! 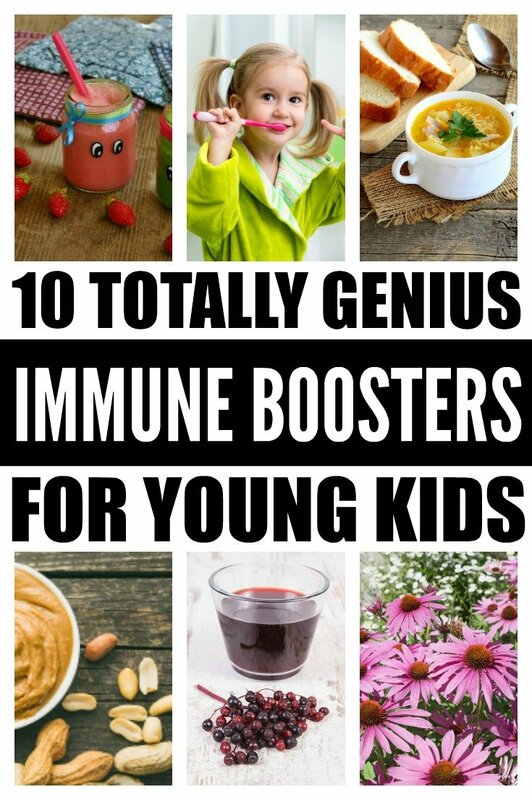 If you liked this collection of immune system boosters for kids, please share it on Pinterest! And if you’re looking for more health care tips for kids, please follow our Parenting board on Pinterest!